Today, 1st November, the World Of Underworld explodes as the band launch their perplexing Drift series - an epic year-long road trip by the band (Karl Hyde and Rick Smith) in collaboration with Tomato and friends old and new, from playwrights to DJs in jazz and techno to painters and poets. Kicking-off with their feet firmly in their world of live dance music, Another Silent Way is uniquely and unmistakably Underworld, all thunderous drums, relentless acid lines and cyclone vocals. This new recording is both a standalone digital release and the first in a series of weekly instalments of a new cross-platform Underworld project - Drift. Drift is an ongoing experiment that will regularly publish new Underworld material – music, film, stories, etc – via underworldlive.com. The first release of Drift Episode 1 sees Another Silent Way soundtracking a film made in collaboration with the UK drift racing community and Tomato and shot entirely at the Rockingham Speedway in Corby in summer 2018. 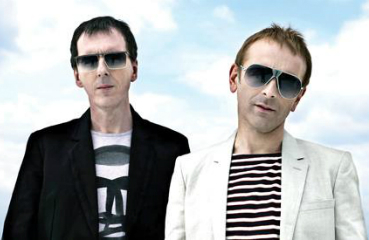 Underworld have also today announced a series of very special club shows in November and December. These gigs are most intimate the band have played since the early '90s. Rick Smith said: "In 2017 we reconnected with a personal joy of performing in small venues when Karl & I took our show to the Zepp club in Osaka prior to headlining Ultra festival in Tokyo. "The whole experience was so deeply inspiring we just had to do it again." Their last London headline gig at the 10,000 capacity Alexandra Palace sold out five months in advance. At these new shows, Underworld will be experimenting with a mix of brand-new material, classic tracks and little heard gems from their deep archive.